Synonymous with sourcing and delivering top-quality fuels throughout Donegal and beyond for more than half a century, Andrew McLaughlin & Sons opened their own smokeless fuel manufacturing facility in Buncrana two years ago. We travelled to the north west and caught up with Andrew McLaughlin Jnr. to find out more about this exciting new venture which has transformed the outstanding, progressive family business. The roots of Andrew McLaughlin & Sons can be traced back beyond the 1950s when Andrew Snr. started delivering coal in the Buncrana area - as his father had done before him. Andrew is still very much involved today, in tip-top shape at the age of 77 and working six days a week. He’s joined in the running of the family business by his sons, Andrew Jnr. and Noel. Under the A&N Fuels banner, the McLaughlins established themselves as one of Donegal’s leading fuel distribution companies, their reputation for providing top-quality home heating oil, diesel, agricultural diesel, lubricating oils and coal built up over four generations, with a service to match. Prompt delivery of the highest-quality fuels at competitive prices ensured that A&N Fuels lived up to its catchphrase – ‘the company that always delivers’. And recent developments at the company are sure to see them move even further ahead of the competition: We’ve always tried to keep ahead of the posse,” says Andrew. “We’ve put in a new manufacturing plant here in Buncrana to manufacture smokeless fuels, because we see this as the way forward for the fuel industry. Ecoglow and Ecostove smokeless fuels are manufactured by Andrew McLaughlin & Sons in Buncrana and distributed nationwide to be delivered through a network of retail outlets, coal merchants, service stations, builders’ providers and co-operatives. 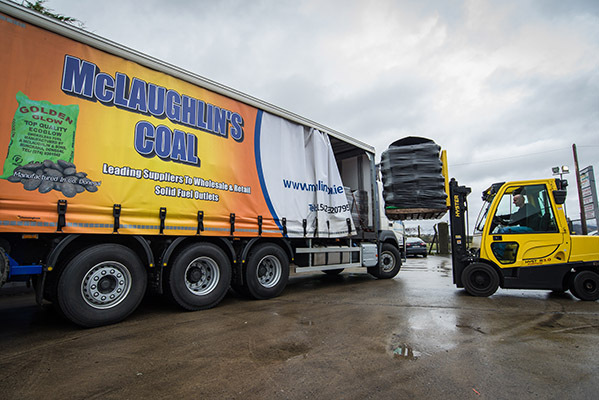 With depots in Buncrana, Carndonagh and Ballyshannon as well as a network of authorised distributors, all types of coal and fuels are distributed across County Donegal. On the distribution end of things, regular investment ensures that a fresh, immaculately-maintained fleet provides an unrivalled service. Andrew McLaughlin & Sons / A&N Fuels operate a fleet of 20 trucks, ranging from 15-tonne up to 44-tonne, as well as availing of the services of some local haulage companies on a subcontract basis. “We have three artics, all Volvo, and these are fitted with Moffett Mounties so we can deliver anything from half a pallet to a full lorry-load. We’ve just recently bought a brand-new eight-wheel, tri-axle Volvo Tridem, which has been especially configured to work with Moffett Mounties. Needless to say, Andrew is delighted with how the business has progressed since they opened up the smokeless fuel manufacturing plant two years ago: “It’s growing all the time and we are hiring new staff,” he states. “This business is changing, we’re expanding rapidly. This is top-quality fuel and is recognised as such. Although Andrew McLaughlin & Sons never received any grants or Government assistance along the way, Andrew isn’t one to moan: “We’ve had to do it on our own bat, but it has worked out well for us,” he says. “Ultimately, we have the same goals as the Government – they want to sell smokeless fuel and so do we. We are all on the same side. The fuels we were replacing are all imports so we are reducing imports, reducing the carbon footprint and generating employment. It’s win-win all around. “We are also in the process of developing a lab, which will help us to create new and better products. There is a major shift in the fuel sector in Ireland taking place and it is exciting to be at the forefront of that. The Minister aims to make the entire country a smokeless zone within five years and we are hoping to fill that void. We have the manufacturing plant and the R&D in place and we will continue to push onwards.